I was elated when I got engaged. My happily ever after was becoming a reality. I was about to live a dream I had never actually dreamed about. Little girls fill their heads with daydreams of their cupcake wedding dress and the tiara on their head. Well, not this girl. My mind was slowly filled with 1,000,000 different ideas about my wedding. 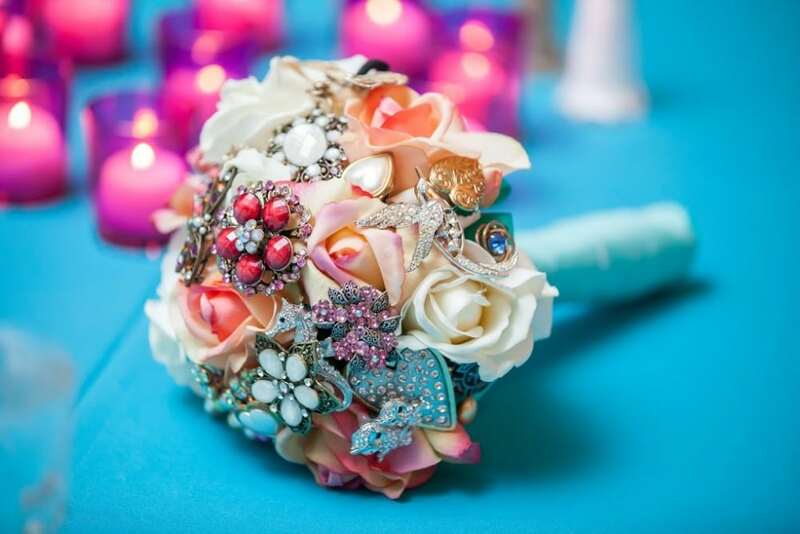 Eight hundred Pinterest pins later, I had one set in stone idea, a brooch bouquet. Not to toot my own horn, but I put the “C” in crafting. I knew I wanted to make my own bouquet. Thanks to those eight hundred pinterest pins, I decided on doing a mixture of brooches and flowers. I found some beautiful “real touch” roses at my local craft store that were perfect. They were so realistic, no one believed they were actually silk flowers! I had quite a few brooches and nick-knacks from a very special person in my life, Granny Bo. I was even able to use some of her nursing pins that she received from her fifty years in the nursing field. The bouquet turned into a wonderful way to remember her on a day she could not be with me. It was slowly turning into a piece of art. I chose my other brooches by color and meaning. My sister gave me a brooch that belonged to someone very special she loved. I also included brooches that were a gift from my mother-in-LOVE and earrings my mother always wore when I was a child. Another special touch that I came across, was my now husband’s pin from his four years in the navy. (He still won’t let me have his pea coat; he swears he might go back out to sea and need it. I am patiently waiting.) I incorporated a Maltese cross to represent his job as a firefighter. It was important to be able to carry a little piece of all my loved ones with me on my wedding day. My fingers were raw by the time it was done! The project was worth every penny out of my pocket and every second of the 30+ hours it took to complete. I had a sunset ceremony on the beach in Florida. My bouquet blended into the gorgeous sunset. I was able to help my family remember Granny Bo, through all the sweet touches of her I included in the bouquet. My bouquet now sits proudly on my bedside table. Every time I look at it, I am reminded of my beautiful wedding, and all the feelings I had that day. Maybe one day, I will have the pleasure to give it to my daughter and watch her carry it down the aisle on her wedding day.